A Eurasian species, not as showy as M. scorpioides or M. sylvatica, but locally common along forested trails and roadsides, clearings, shores, lawns, old gardens; more often in weedy places than undisturbed forests. First collected in 1883 in Ingham Co.
Herbarium specimens of M. sylvatica with shriveled or immature corollas are easily misidentified as M. arvensis. One should look for corollas displaying a well-pressed limb to be sure of having this small-flowered species. 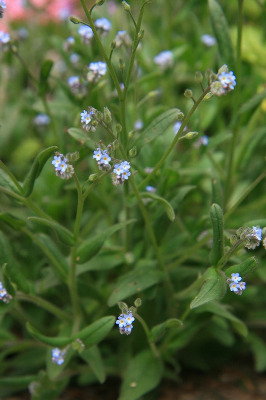 White-flowered plants may be locally common with blue-flowered ones. MICHIGAN FLORA ONLINE. A. A. Reznicek, E. G. Voss, & B. S. Walters. February 2011. University of Michigan. Web. 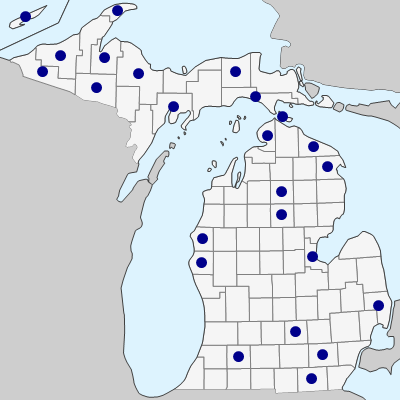 April 19, 2019. https://michiganflora.net/species.aspx?id=584.